The season arc plot has finally risen up, just in time to be squashed back down again by the unrelated plot of the DCTV crossover event! I think something similar happened last time one of these shows had a crossover event (there have been a lot; forgive me for not being specific) and I don’t get the logic of it. Why not use the crossover for filler and avoid breaking pace on the storyline that actually matters? Plus you have the hiatus coming up too, which only makes the pacing worse... But hey, I’m no bigtime TV writer, so they clearly know better than I do. This week’s episode starts where last week’s left off, with Joe and Barry confronting the DeVoe pinpointed by the Council of Wells. Actually, I tell a lie — it technically starts off with a little flashback scene involving DeVoe and his wife, and although I have a few issues with this episode (more on that later) I can’t fault this stuff with Mr. and Mrs. DeVoe. Comic book shows like The Flash rarely attempt to humanize the villains. Whenever they do show villains being ordinary and likeable, that ordinary likeability is usually revealed to be part of an evil scheme, such as the case of Eobard Thawne pretending to mentor Barry and the rest of Team Flash as Harrison Wells in the first season. With Clifford and Marlize DeVoe, however, you can tell that they genuinely care about each other and they are, until the events of the episode occur, just a normal couple. The flashback scene we’re given at the episode’s open has them eating lunch together in Clifford DeVoe’s classroom after he, a college history professor, has released his inattentive and listless students for the day. It’s a charming scene of bantering and lamenting the loss of intellectual capacity in younger people, which leads to the introduction of their life-changing plan and the object that would turn Professor Clifford DeVoe into the villainous Thinker. 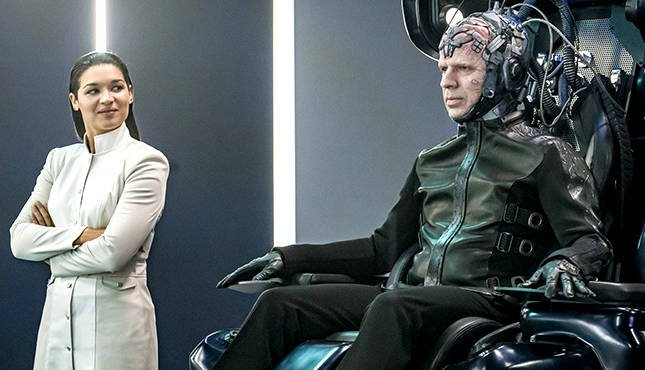 It turns out that the DeVoe couple is made up of two geniuses: Clifford, who, despite his focus in history, is also something of an ideas man for world-altering inventions, and Marlize, whose degrees in robotics and cybernetics allows her to bring her husband’s ideas to life. Marlize makes a “thinking cap” to help improve the intellectual capacity of its human wearer, but they need a never-before-seen power source to actually make it work. How convenient, that all this is taking place roughly four years ago, and a certain Harrison Wells is about to turn on his newfangled power source, the particle accelerator! Because I guess there’s no innovation without risk, the DeVoes decide to use the particle accelerator explosion to power the stupid looking hat by sending Clifford out into the ensuing dark matter storm to get hit by lightning. He dies, but he gets better. Once he wakes up from death, Clifford has the ability to know all things, including who Jack the Ripper actually was and that Barry Allen is actually the Flash. Knowing stuff evidently makes you evil, too, since the DeVoes go from being an endearingly devoted couple of enthusiastic academics to a married team of villains who decide Team Flash has got to go. But why, though? Sorry, that wasn’t a segue. I’m literally asking why this happens. I actually ask “But why, though?” quite a bit throughout this episode, since the show has reverted to its old, terrible pacing and decided to throw a bunch of plot stuff at us in one go, without allowing for a build in tension or a slow, careful unraveling of its mystery. So we get the backstory of The Thinker in this episode, but no explanation for how he went from a normal, if frustrated, professor to a criminal mastermind. His assistant’s identity as his steadfast wife is revealed, but how did she go from a cheerful professor to being the keeper of her husband’s evil lair and supporter of his nefarious deeds? Was it all because they realized Clifford was dying of an accelerated form of a degenerative disease after getting his Thinker powers? Does dying make people into villains? And finally, we have Barry Allen’s sudden turn in this episode, in which he goes from zero to paranoid so fast it made his reaction to Savitar look mild in comparison. Most of the present-day plot of “Therefore I Am” is all about Barry’s ramping paranoia over DeVoe, and that would be fine if the paranoia, you know, actually ramped up. Instead, Barry is instantly, doggedly suspicious of the DeVoes — and yes, I know that Barry has a history of not being subtle around people he doesn’t trust (it’s one of his stupidest traits, and that’s saying something for a guy who has a lot of stupid traits; like, remember when he broke the universe that one time?) but I’m pretty sure he’s never clumsily broken into a suspect’s house to gather clues like a crazy person before. Barry’s actions in this episode seem more like the result of a three- or four-episode minor arc, rather than the plot of the episode that literally introduces our hero to the season’s villain. From the first moment he meets DeVoe, Barry is almost manic in his desperation to nail DeVoe as his archenemy and fights against the much more normal-thinking members of his team with the same degree of bonkers as a doomsday prepper trying to tell non-believers about the impending alien invasion from the safety of his underground bunker. Every other member of Team Flash looks at Barry with the same expression of bewildered worry — an expression that I probably had on my face while watching the episode since, like I said, it makes zero sense for Barry’s focus on DeVoe to reach such a degree so fast. For heaven’s sake, Barry nearly gets fired! He gets a restraining order put against him after Marlize complains, sobbing, to Barry’s boss about the crazy guy stalking her husband at his work and breaking into their home. In the episode, Barry explains his actions as just a result of “a feeling” he has (technically, he calls it his “Spidey-sense,” so nice Marvel reference, DC show) regarding DeVoe, telling him that he’s the reason for everything that’s happened since he got out of the Speed Force and the reason he got out of the Speed Force at all. Barry thinks DeVoe has potential to be worse than any foe they’ve ever fought, and the fact that previous villains who know the Flash’s future have cited DeVoe as an important enemy means Barry is probably right. But these excuses seem pretty flimsy when contrasted with his actions in the episode. I mean, yes, Barry proves to be correct when DeVoe straight-up admits that he’s the villain of the story and knows all about Barry, the Flash, and every member of his team. But the culmination of this narrative doesn’t really make up for its poor execution, since we the viewers already knew that DeVoe is The Thinker and the fun would have come from the ratcheting tension of Barry and the team figuring it out. So, just like the mysteries of previous seasons, The Flash managed to bungle the big reveal by shoving all the tension into one episode, rather than over the course of a few. But I guess they have time to make up for it, so I’m not going to write this season off just yet. WALLY CAME BACK! For the wedding, presumably, so I really hope he’s involved in the crossover event. "How are you not scared?" "Because we're the Flash." This season’s Barry/Iris relationship has been pitch perfect. A great balance of involving the romance in the plot as critical elements of two of the show’s main characters, and not allowing it to consume the plot. Another mystery of the episode: Marlize’s dedication to Villain Chic with that slicked-back hair and lab coat. "What is knowledge without love?" Yeah, sure, The Thinker. To quote Jeff Winger: "Profound, but technically meaningless."